This year’s Thanksgiving dinner comes in as the cheapest in nearly a decade. The annual Thanksgiving dinner cost survey points to a 0.4% cheaper feast. 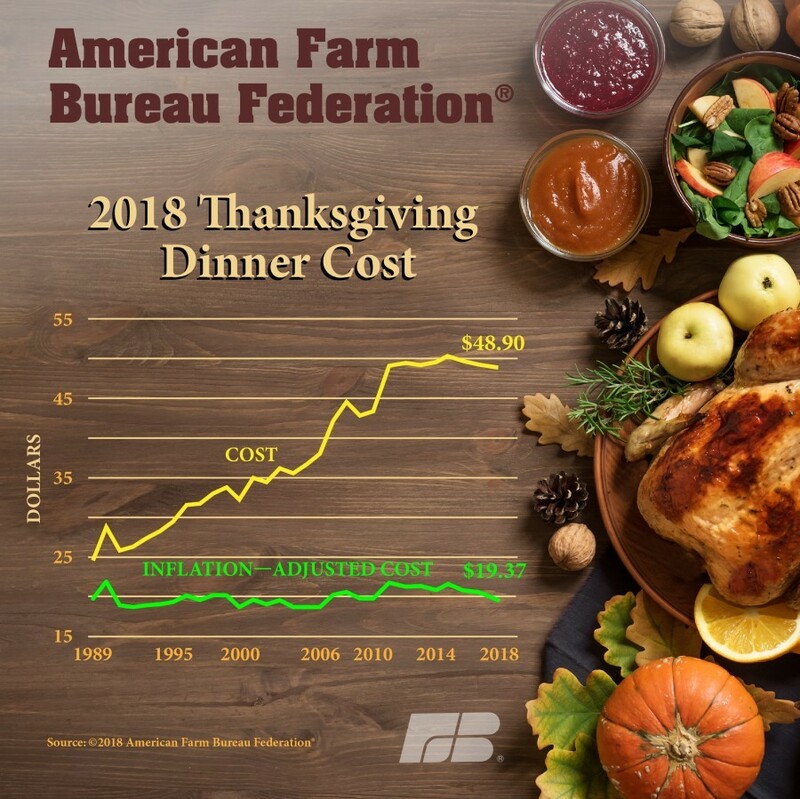 The American Farm Bureau Federation has tracked the cost of this holiday feast since 1986 with a standard menu. This year’s cost savings are the continuation of a trend. Costs are now at 2010 levels. A gathering of 10 will come out to $48.90 for a 16-pound turkey, stuffing and a standard helping of sides. Add in ham, russet potatoes and green beans to bring the total to $61.72. Much of this year’s savings are from the centerpiece — the turkey. The price of turkey per pound is $1.36, or 3% cheaper than last year. Turkey production is down 1.7% since last year. Offsetting this drop is a 3% fall in consumption and a 5.8% drop in exports. The supply-and-demand balance is helping to make this year’s feast even cheaper. The chart below shows the true cost of a Thanksgiving meal in yellow and the inflation-adjusted cost in green. Adjusted for inflation, Americans are spending about the same on a Thanksgiving meal since tracking began in 1986. While this meal might be cheaper thanks to a glut of turkey, the Consumer Price Index estimates that general home food costs are up 1%. Data from the Energy Information Administration (EIA) shows that nearly two-thirds of homes will use electricity for cooking. Natural gas makes up with other third, with propane accounting for just a fraction of energy use. Those using natural gas over electricity spend 9.7% more on energy for cooking than their electric counterparts. Even so, it’s a minor expense, with the EIA estimating that natural-gas homes spend $34 on energy for cooking per year. Next »Is a Santa Claus Rally on the Way?